The Porsche 911 RSR n.92 is the winning car of the GTE PRO class in the 24 Hours of Le Mans of 2018. After the withdrawal in the LMP1 category, the German team devoted itself strongly to the GTE categories. 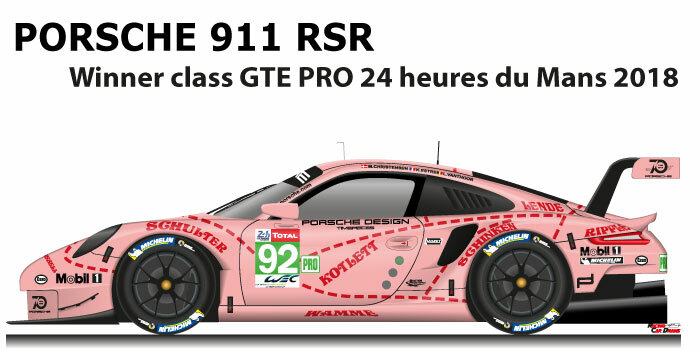 To celebrate the seventy years of life, for the French race two cars were lined with liveries reminiscent of the Porsche, the n.92 recalled the 1971 Porsche 917/20 nicknamed Pink Pig that was all pink and specified the parts of the pig. Michael Christensen, Kevin Estre and Laufens Vanthoor won the Porsche 911 RSR n.92 in the GTE PRO class at the 24 Hours of Le Mans 2018, for the trio was the first success. In the race the cars of the Stuttgart builder dominated the race, the duel was between the winning Porsche and the 911 n.91 driven by Bruni, Makowiecki and Lietz, the latter came second at the end of the race with a turn away from the sister car. Drive Type: Rear wheel drive.